As an app developer, you may have been asking yourself this crucial question: how am I going to monetize my app. Today, we are going to explore what are the most interesting options. It is important to know all the possibilities that you have to monetize your app. Firstly, you can simply sell your app. This is the “paid app” business model. 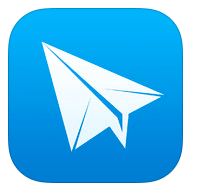 For instance, the app Sparrow is sold 2,99 $. Another way to monetize your app is the freemium business model. Here, your app can be downloaded for free but extra features will be sold. Certain features can be sold in your app through In-App Purchases (IAPs). For instance, you can make people pay to stop having ads in your app. Sometimes, you can also buy extra moves to reach a new level like in the game Candy Crush. Therefore, if you opt for this business model, try to immerse your users to be sure that many of them will go for extra features. It is also important to monitor your competitors to understand how they monetize their apps. The successful strategic game “Clash of Clans” uses smart techniques to influence users to purchase additional features. Indeed, when a new user begins to play, everything he wants to do is really fast (creating buildings, forming troops and so on). Then, when he is evolving in the game and he reaches higher levels, everything begins to take more and more time, unless you are ready to pay to accelerate the game. As you can see in the example below, when you want to upgrade the “elixir collector” from level 2 to level 3, it only takes 15 minutes while it takes 2 days to upgrade it from level 8 to 9. Therefore, some users become frustrated and they will be more likely to buy extra features in order to accelerate the speed of construction, just like they were used to. 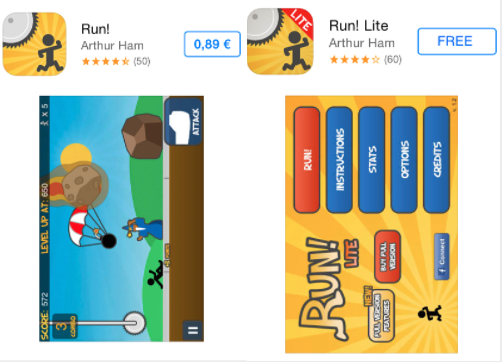 Another formula is sometimes chosen to monetize apps: the lite and regular versions. It is possible to allow users to test you apps in a lite version. The aim is obviously to sell the regular version with all the available features. I would advise to create a version with In-App Purchases rather than a lite version because it is more difficult for users to see completely the advantages of the regular version. Moreover, users could be satisfied with the lite version while with In-App Purchases users can be more influenced to buy extra features. We can also observe that less and less apps use this business model. You can also add ads in your app to monetize it: In-App Advertising (or In-App Ads). Those ads usually promote other apps. There are different platforms that allow you to sell your advertising space. Here is a list of some ad networks where you can sell your advertising space. Test them in order to know which one would fit your interest the best and generate the most revenue for your app. You could also use Tapdaq, a cross-promotion network. This great project allows you to exchange your advertising space with other apps.If you are running on low advertisement budget, you can advertise your app by exchanging your advertising space with other apps. We recommend you to choose properly the kind of ads you insert in your app. Indeed, in certain apps, ads can appear in full screen while playing a game. Users could therefore click on the link without willing it. It could become really irritating and therefore some users will leave your app or write bad reviews. So, I guess we have seen how you can monetize your app. It is interesting to observe that you can combine different ways of making profit. For instance, it is possible to create a paid app with In-App Purchases and even In-App Ads. Nevertheless, I am not sure that people will be happy to have a lot of ads if they pay for an app. Now that you are aware of all the possibilities, let’s see which ones are the best. Currently, the freemium is the leading business model. Why? Because users can understand the added value of your app. You reduce the risk for them to buy something they do not really need. We can see that app marketers have begun to understand this phenomenon on the chart below. Indeed, the number of free iOS apps is increasing. In April 2013, 90% of apps were free and 6% of apps cost less than 1 $. So, if you create a paid app, you will probably be fighting free competitors. Do not forget to monitor your competitors! Data for iOS Apps using Flurry Analytics in April of each year, and weighted by monthly average users. Also, when app marketers changed the price of their apps to see what is the most profitable business model, a huge part of them realized that the freemium is the best one. Indeed, in April 2012 and 2013, respectively 76% and 80% of tested apps lead to the conclusion that the freemium model was a better policy. That is to say that even charging users of 0,99$ lead to a decrease of the demand. This freemium trends is bigger for the Google Play. 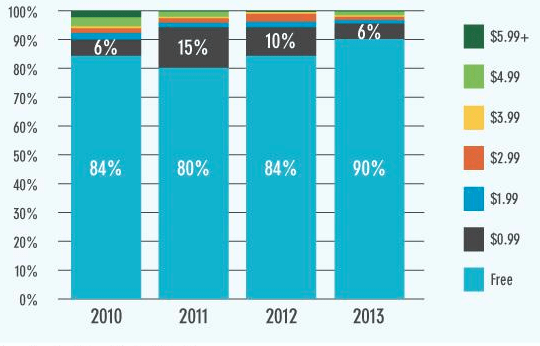 Indeed, Android users are less likely to pay for apps. As we have seen, there are a lot of free apps in the App Stores. You will therefore have more trouble to make your app downloaded if it isn’t free. Actually, people are likely to try your competitors’ app if they are free. Let people try your app to understand why they need it so much. 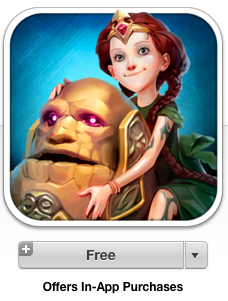 No longer allowing apps to be categorized as “free” if they offer in-app purchases. Preventing users (particularly children) from being debited through an app’s delfault settings. Those changes are probably the results of unauthorized In-App Purchases made by children. Indeed, Google recently refund upwards of $19m to parents of children who were able to make unauthorised In-App Purchases via Google Play. Those changes could lead to a decrease your app downloads and it could therefore impact your app rankings. Actually, a part of users that never buy extra features could stop downloading apps with IAPs. Moreover, some parents could stop downloading apps with IAPs fearing that their children buy extra features in them. We still don’t know the impacts that all those changes will have but you should keep an eye on them. As we have seen, the freemium model keeps the leadership but it is not necessarily the best business model. You have to pick the right business model according to your competitors and the aims of your app. Nevertheless, do not hesitate to test your app in order to see which business model works the best. What about you ? 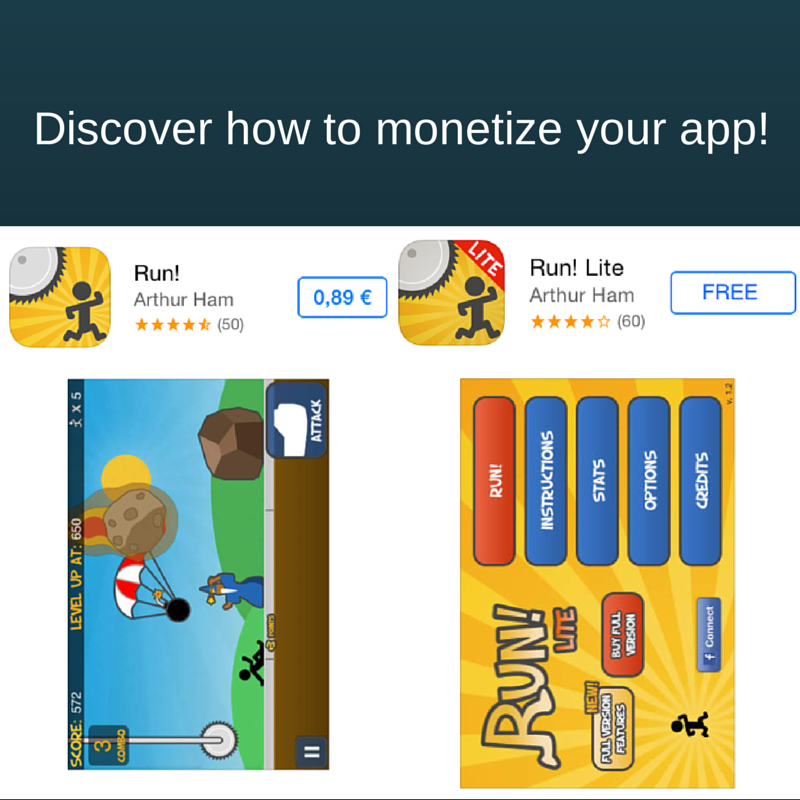 How do you monetize your app? What’s the best way according to your experience? Share it with us in the comment section below. Thanks!